Jaipur (Rajasthan): The Indian Federation of Working Journalists (I.F.W.J.) nominees have won the posts of President, General Secretary, Vice President, Treasurer and four in the executive committee in a keen contest for the Pink City Press Club. Results were announced today (March 27 2018). Mr Abhay Joshi won the presidentship securing 192 votes while his immediate rival Mr. Radha Raman Sharma also polled 192 votes. Both will hold office by turn. Mr. Mukesh Chaudhry of the daily Navjyoti was re-elected general secretary. Abhay Joshi was till recently the Vice President of the IFWJ unit in Rajasthan, headed by Com. Upendra Singh Rathore of Jodhpur. IFWJ veteran Devendra Singh formerly of ETV won the Vice Presidentship. 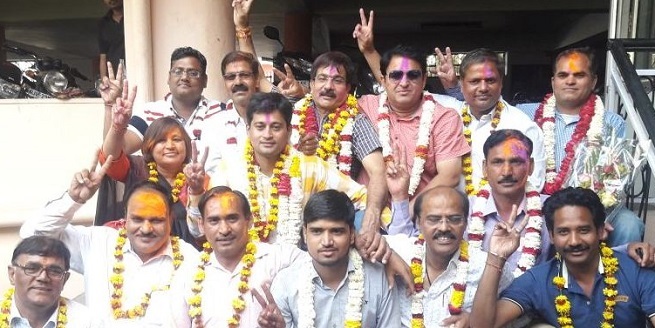 A senior journalist Raghuvir Jangid was elected Treasurer. The four elected to the club executive included Giriraj Gurjar, Vinay Joshi, Vimal Singh Tanwar and Ramendra Singh Solanki. A notable feature of the Press Club election was that a vetran journalist and former president Ish Madhu Talwar’s fraction suffered crushing defeat. His candidate for Presidentship Harish Gupta, who claims to be general secretary of Rajasthan Working Journalists Union, came fourth in the contest in a six-cornered poll. Ashok Bhatnagar who broke from the IFWJ and joined the dead outfit, got just two votes. He was also blessed by Talwar. Talwar had lost very badly last year when he had himself contested for Press Club presidentship. His clout with the BJP government was lost when the Rajasthan Govt. evicted him from the Govt. flat as Talwar is no more a working journalist. Full credit for this glorious victory goes to Comrade Upendra Singh Rathore, State Unit President. Com. Rathore had organized the IFWJ Working Committee meeting in Jaipur on 28th October last year to mark the 67th Anniversary, presided over by Com. K. Vikram Rao president IFWJ He had hosted the IFWJ’s National Council 71st session in the frontier town of Jaisalmer 23-26 September 2016 when delegates had demonstrated at the Pakistan Border for a free Balochistan and the liberation of Pak-occupied Kashmir. Three days after the IFWJ rally, the Modi government carried of a “Surgical Strike ” inside Pakistan.